To prepare the dressing combine the olive oil, rice vinegar, soy sauce, sesame oil, sucanat sugar, garlic, ginger, and red pepper flakes in a jar with a screw top lid. Shake vigorously to combine. Set aside. To prepare the carrots slice them into thirds widthwise. Slice each third into 1/8 inch strips. Next, slice these strips into 1/8 inch match sticks. Repeat with the remaining carrots. The end result should be long and skinny strips of carrot. Add to a large bowl. Next, slice the kohlrabi in half. Reserve the other half for another use. Using a paring knife, peel the kohlrabi half needed for this recipe. Lay the kohlrabi cut side down and slice it into 1/8 inch thick slices. Slice these pieces into 1/8 inch matchsticks. The kohlrabi should end up being a similar shape and size as the carrots. Add to the bowl with the carrots. For the apple will want to cut each side off the core. Discard the core and lay each piece cut side down. Cut the apple pieces into 1/8 inch slices. Cut each of these slices into 1/8 inch matchsticks. The apple should look like the carrot and kohlrabi strips. Place into the bowl with the carrot and kohlrabi. Slice the scallions into thin rounds on the bias (which simply means on an angle) and add them to the bowl. Add in the shredded purple cabbage and the dressing. Toss to combine. 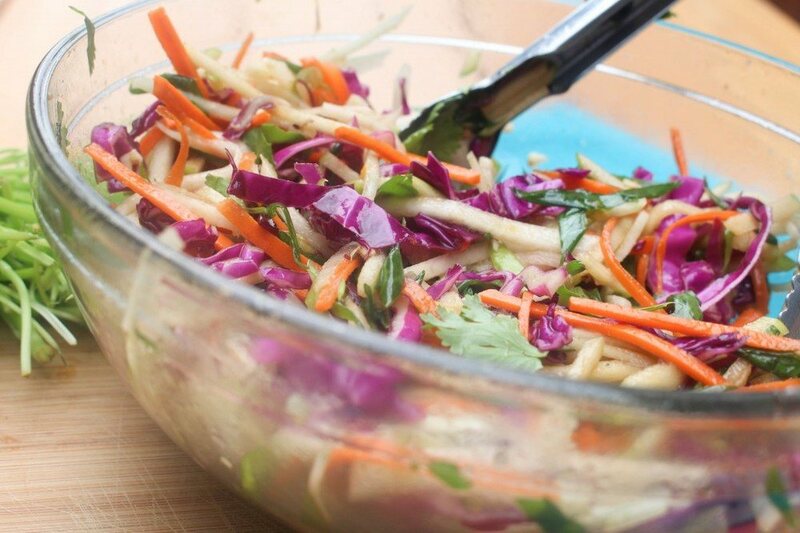 Serve immediately or allow the flavors to develop by leaving the slaw in the fridge for 1-4 hours before serving.